New York and California restaurants, bars and retailers now have access to hundreds of boutique wine, beer and spirits products via the LibDib platform. Liberation Distribution (LibDib) is the first web-based three-tier alcohol distribution platform. “Adoption in California has been tremendous and as of today we now offer restaurants, bars and retailers in New York access to this new way of purchasing unique and craft products," said LibDib Founder and CEO, Cheryl Durzy. 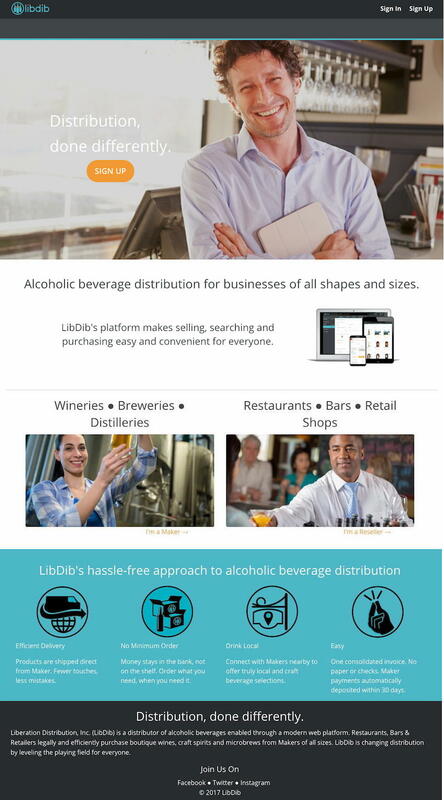 Liberation Distribution (LibDib), the first alcohol distributor and technology company to offer a three-tier compliant web-based platform, today announced that LibDib is now live in New York. As of today, restaurants, bars and retailers (RB&Rs) in both New York and California can purchase hundreds of boutique and craft products that previously were unavailable. In addition, LibDib announced that the company has created a platform sales team in both states to increase the adoption of the LibDib platform by RB&Rs. LibDib now has more than 450 products on their multi-state distribution platform, with new Makers and RB&Rs signing up every single day. Products include boutique wines, craft spirits and microbrews (available in California only) made by Makers of all sizes and from more than 20 states and 8 different countries. Restaurants, bars and retailers in California and New York can now order from LibDib to receive products from Makers of any size and from any location, whether down the street or from across the globe. Licensed resellers can create an account and sign up on LibDib.com. The LibDib web-based platform automatically handles the invoicing, payment processing, collections, and taxes, allowing both Makers and retailers to do business in a more open, efficient and cost effective way. Liberation Distribution, Inc. (LibDib) is a distributor of alcoholic beverages enabled through a proprietary desktop and mobile friendly web platform. LibDib changes alcohol distribution by leveling the playing field for everyone. Using LibDib, Restaurants, Bars & Retailers can legally and efficiently purchase boutique wines, craft spirits and microbrews from Makers of all sizes. The company was founded in 2016, launched in March 2017, and is based in San Jose, California. LibDib can be found online at LibDib.com as well as on Twitter, Facebook, Instagram, YouTube, and LinkedIn. Liberation Distribution, LibDib and the LibDib logo are trademarks or registered trademarks of Liberation Distribution, Inc. Third-party trademarks mentioned in this release are the property of their respective owners. The LibDib web-based platform automatically handles the invoicing, payment processing, collections and taxes, allowing both makers and retailers to do business in a more open, efficient way. Until LibDib, alcohol distribution had not changed since the inception of the three-tier system at the repeal of Prohibition in 1933.